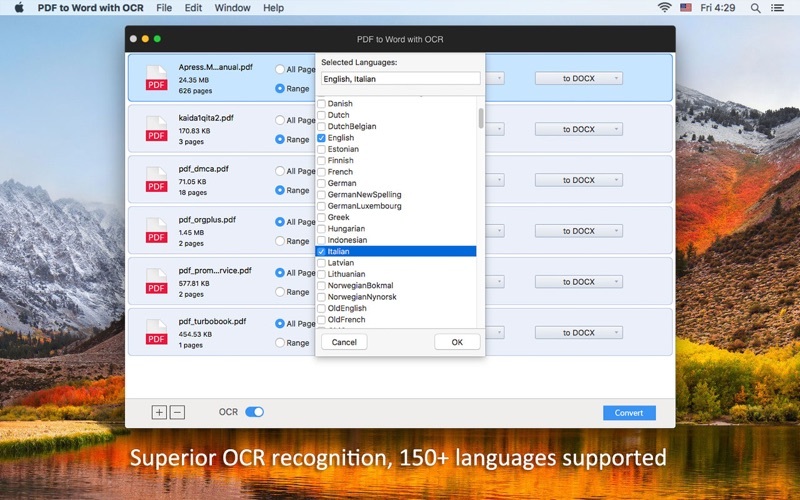 PDF to Word with OCR is a powerful PDF to Word converter that can convert PDFs (native & scanned PDF or password encrypted PDF) and common images into editable Word format with the most advanced OCR technology. With it, reusing and editing PDF documents would be effortless and efficient. *Convert PDF(native and scanned PDF included) to Word documents (.doc, .docx) and then you can edit it in Microsoft Office Word as need. * Convert images (jpg, tiff, png, bmp and gif) into fully editable Word files easily. * Use superior Optical Character Recognition (OCR) system to mark out text, table and images automatically or manually. * With high quality PDF to Word conversion, you can save much time of rewriting the text and tables by hand. 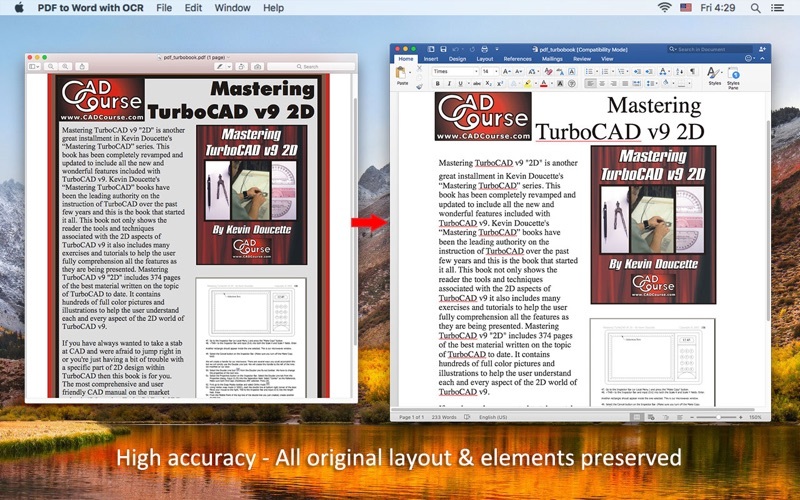 * Convert both native and scanned PDF to DOC or DOCX files with the most advanced OCR engine. * Support images (PNG, JPG, BMP, GIF and TIFF) to editable Word document conversion. * Support over 150+ recognition languages: English, French, Italian, German, Russian, Czech, Turkish, Portuguese, Polish, Romanian, Ukrainian, Greek, Croatian, Chinese, Bulgarian, and support PDF files that composed in multiple languages conversion. * Support encrypted PDF to Word conversion. * Easy to use: add PDF files and images by drag-n-drop, select the right languages and mark out the texts, images and tables on each PDF page correctly; then preview and start conversion. * User-friendly interface and fast conversion with no quality loss. * Standalone software, no Adobe Acrobat or Adobe Reader needed. * Fully support macOS High Sierra 10.13 now! * To convert user password encrypted PDF files, you'll need to type in the corresponding password before start converting. * It’s just able to add and handle only one file at a time for more accurate and faster conversion. 1. Updated the OCR built-in technology. 3. Support batch converting scanned PDF and Images to word document. 4. Support select preferred pages to convert. 6. Well compatible with macOS High Sierra 10.13. 7. Some other optimization and minor bugs fixed.